Google had rolled out a new experience for composing and replying to the gmail messages. This is faster, cleaner and powerful. 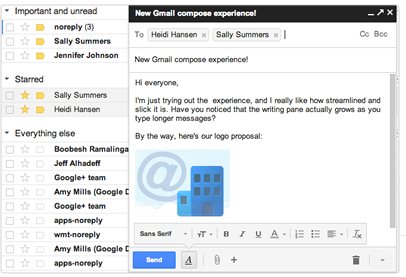 There is no need for any extra configuration for using the gmail's new compose feature.These changes are automatically applicable if we are using gmail Standard View. - We can check our mail while writing the new mail. - Formatting options are only appearing when we require them, that makes it more compact. - Gmail has given new keyboard shortcuts. - We can drag and drop the recipient addresses. - Drafts can be minimized and later rewrite and send to recipients. After reviewing the all new features, We can say that the main target of gmail's new campus is to make the mailing faster.